The next couple of weeks may find this commentary rather short, as I’m “on the road” and pretty busy. Let’s take a quick look at this market though. Times like this I recall the old brokerage adage “Where are the Buyers and Where the Sellers?”. That refers to price levels. The Buyers made a commitment at that 4594 level with that gap up. 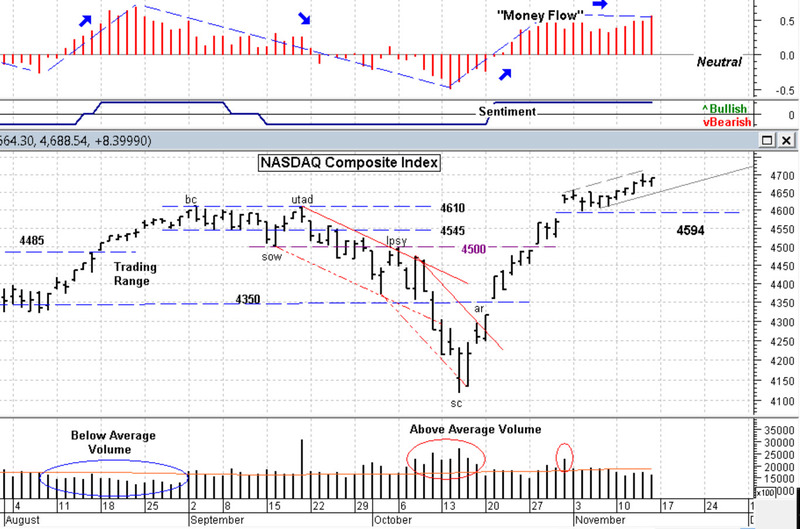 So far we really have not seen much selling; low volume and narrow bars. The best question to ask is where the positive price action is. The table below will give us that indication. 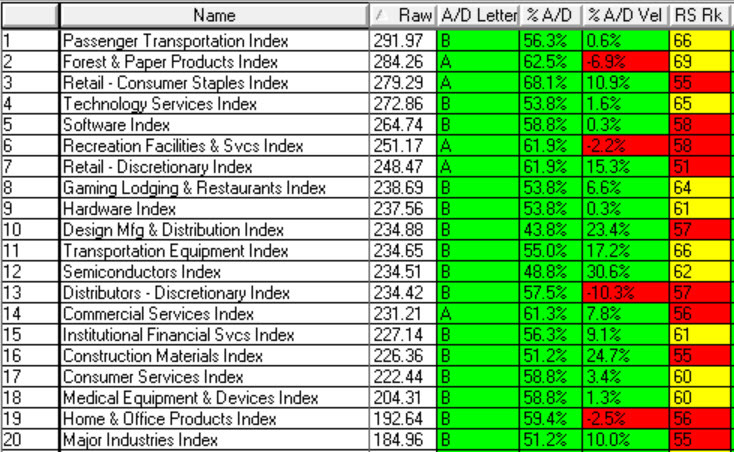 These are the top 20 Industry Sectors (out of 64 total) arranged in short term strength. Ideally, this is where we have been and should be now. By way of a short explanation: “A/D” is Accumulation / Distribution (buying/selling) and “RS” refers to Relative Strength (stronger or weaker than the rest of the market). The color codes are straight forward, Green is good, Yellow is neutral and Red is weak. BTW, these sectors correspond to the Bloomberg sectors, so if you are interested to find out which stocks are in them you can “Google” Bloomberg Industry Sectors or Groups. That’s it for now, got to run. Have a good week. …………. Tom ………..